ABB is bringing electrical installation tools into the modern age with the ground-breaking new Smart®Tool+, a die-less crimper that can scan lug characteristics, automatically configure itself to deliver a solid crimp, check for quality in a finished crimp and then load detailed data to the cloud for storage and retrieval. The tool can be used reliably with standard Color-Keyed® lugs sized 3/0 AWG to 750 kcmil for copper and 1/0 AWG to 600 kcmil for aluminum but utilizes its full capabilities when combined with ABB’s equally groundbreaking new RFID enabled Color-Keyed® lugs. The end result is time saved on the job, along with a full array of data collection on critical electrical connections: data that are increasingly specified on QAQC jobs that require high levels of quality control, including hospitals, data centers and military installations. Superior die-less crimping. Smart®Tool+ produces an indent-style crimp that is precisely calibrated to the lug and wire through pressure sensing and preset indentation levels, resulting in solidly bonded connections with configurations that are more predictable than those produced by most die-less crimpers. A range of lug sizes can be entered manually for standard Color-Keyed® lugs or entered automatically by scanning RFID enabled Color-Keyed® lugs. Automatic quality check. The Smart®Tool’s sensors check for the correct compression of a properly fitted crimp. A green light illuminates to inform the user that a proper crimp has been formed, and the crimp quality, along with the connection’s associated information, are logged to the tool’s data storage. If the crimp compression is not correct, the tool signals failure with a red light and reports the failed crimp to the database. Data collection and analysis. When used with RFID lugs, the Smart®Tool+ registers a wealth of information on each crimp, including the lug size, its serial number, the crimp pressure and indentation level, and success or failure. Additional information, such as final connection torque and a photo of the connection, can be entered manually. Set-up strategies can be used to register the location of groups of crimps so that each crimp in each enclosure on a floor, for example, can be accurately and automatically reported along with its location: a system that is faster, more complete and more efficient than recording data by hand. Bluetooth connectivity. Smart®Tool+ data can be downloaded to any computing device by Bluetooth, then uploaded to a secure cloud for permanent storage and retrieval. Analysis and reporting. Using software available in the Smart®Tool+ package, data can be analyzed and seamlessly reported to job supervisors, quality control engineers or any other entity that requires full reporting on crucial electrical connections. Connections made with the Smart®Tool+ are UL Listed to UL 486 A/B. A UL-compliant connection can be achieved with a single crimp on long- and short-barrel lugs and splices, unlike older systems that may require multiple crimps to achieve the same result. ABB Installation Products Inc., formerly Thomas & Betts, has long been known for its high-quality Color-Keyed® compression lugs, a system that uses color and information stamps to clearly identify lug sizes so workers can easily match them with proper dies and wire sizes in the field. 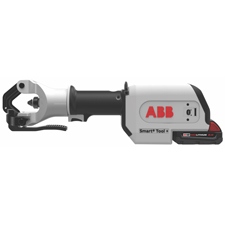 The Smart®Tool+, with its associated ABB RFID-equipped lugs, is the next step toward improving safety and data reporting on compression lug connections in the modern information age.